I knew the Golden State Warriors had to lose eventually, but my fervent wish was that it would be in a manner completely without controversy. Nothing would be worse than losing a chance at history — tying and possibly surpassing the 1972 Los Angeles Lakers’ 33-game winning streak — due to some random bounce, unless it was an obvious missed call. For the purposes of this exercise, the “random bounce” is defined as that ball that takes an irregular or unlikely bounce. The “obvious missed call” is defined as a call that is not just missed, but is actually a gaffe by the officials, such as losing track of the downs in football or the count in baseball. There were already plenty of forces at work against the Golden State Warriors when they took the court in Milwaukee Saturday night in search of their 25th (or 29th, depending on whose math you use) straight win. In a season of firsts, they were trying to accomplish another one: no team had ever swept a 7-game road trip in NBA history. I will make the case, however, that one moment, one event comprised of a Random Bounce AND an Obviously Missed Call, tipped the scales from improbable to impossible for the Warriors, but it didn’t happen that night in Milwaukee. When news of the Saturday’s final score hit the internet, the first thing that came to most people’s minds was that the W’s had played a grueling double-overtime game the night before in Boston. I know that as I watched that game grind to the finish, I didn’t give the W’s much of a chance against the Bucks. What was lost in most of the coverage of the Warriors-Celtics game (that I saw) was one play that changed the course of that game, but not the outcome. It did, in my opinion, change the odds for the game the next night against the Bucks. Those predictions were looking pretty good in the first half, as neither team could get any separation from the other. 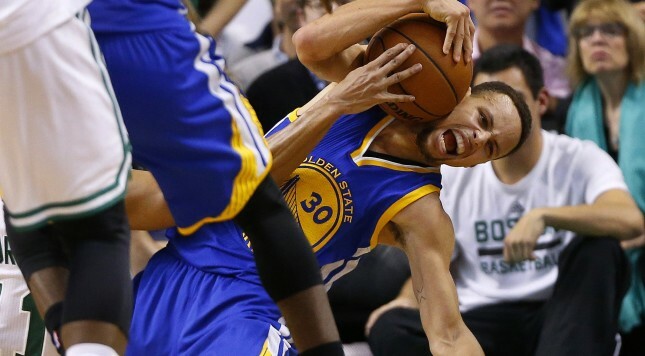 Steph Curry was having an off-night, due in large part to a great defensive effort by Boston’s Aaron Bradley. Curry hit only 4 of 13 field goals in the first half. Thompson’s absence was felt in the Warriors’ inability to space the floor to give Curry the kind of operating room he’s used to. In the third quarter, however, the Warriors started to slowly pull away, and with 3:42 remaining in the quarter, Curry hit two free throws to give his team an 11-point lead. At that moment, the Random Bounce and the Obvious Missed Call took place. It started with Kelly Olynyk shooting a jumper just beyond the left elbow. Olynyk didn’t miss many shots that night, but he drew a lot of iron on that one, and the ball bounced high and over the backboard. On the way down, it grazed a support behind the board, which should have resulted in the ball out of bounds to the Warriors. (Note: This is not the Obvious Missed Call, this is the not-so-obvious missed call.) Hitting the support also delayed the ball’s fall to the floor below. Curry, who was crashing the boards along the baseline, jumped in the air, only to have the ball hang up and fall after he had vacated the space. Boston’s Jae Crowder grabbed the ball after it bounced, and he went up for a shot. That was the Random Bounce. Now comes the Obvious Missed Call. Crowder’s shot was contested, aggressively, by Draymond Green. The whistle blew. Curry raised his hand, pointing up to the spot where the ball hit the back of the backboard. This evidently confused crew chief Monty McCutcheon, one of the best in the business, who assigned the foul not to Green, but to Curry. This was a very significant development, as it was his fourth foul. Curry argued with McCutcheon, and after Crowder’s first free throw, the officials gathered together to revisit the play and make sure they got the right guy. After confirmation from his partners, McCutcheon emphatically signaled to the scorer’s table that the foul was indeed on Curry. I had the opportunity to watch both the Boston and San Francisco TV broadcasts, and this was the only thing the two announce crews agreed on the whole game. Curry was five feet away from Crowder when the whistle blew. It was the Obvious Missed Call. With over 15 minutes remaining in the game, Luke Walton was forced to remove Curry from the game. The Warriors, who had struggled to find good shots all night, now found themselves in quicksand. They traded baskets with the Celtics for a couple of minutes, but Boston got the last hoop of the quarter to cut the lead to seven. Boston, resurgent with the Warriors’ star out of the game, scored the first seven points of the fourth period, and after an Ezeli free throw, quickly tallied four more. The Warriors’ former teammate, David Lee, scored the last six points of that run. By the time Curry came back into the game with a little under nine minutes to go, Boston led by three, and it was a Battle Royal for the rest of regulation and two overtimes. Since the Warriors ultimately prevailed, little attention was paid to the Random Bounce and the Obvious Missed Call. Let’s take a moment, though, and reconstruct the game assuming the “RB” happened, but the “OMC” did not. If Green was assessed the foul, it would have been his fourth as well, and it’s likely Walton would have taken him out. However, he left the game at the end of the third quarter anyway, so the net result was that the Warriors would have had Curry in the game instead of Green for the last three minutes of the quarter. Green is a great player, but Curry is the best player in the league, and there’s a drop-off whenever he comes out of a game. It’s absolutely possible that a lineup with Curry holds or even extends that 11-point lead over the last few minutes of the third quarter, which would have changed the dynamics of the fourth quarter pretty dramatically. If, for example they had pushed the lead to 15, Curry might not have had to play much of the fourth quarter, as opposed to the 18 minutes he logged in the fourth quarter and overtime. I believe, in fact, that if that game went the way many have this year — with the Warriors putting together a small run to break the spirit of their opponent — Green, Iguodala, Bogut and Shaun Livingston all would have played far fewer minutes Friday night, allowing them to be fresher for the Bucks. In addition, had the game ended in regulation, they would have gotten on their plane a half-hour sooner, which doesn’t sound like a big deal until you face a back-to-back with a 3-hour flight in between. Now that I’ve laid this out for you, let me explain what it means, and probably more importantly, what it doesn’t mean. 1) It is not an “excuse” for why the Warriors’ streak was broken. I don’t believe teams which win their first 24 games need an excuse when they lose one. 2) It does mean that the Warriors’ flirtation with basketball immortality did not come to a natural end. As much as other factors contributed to their loss in Milwaukee, I would have loved to see them have a chance to win that game without being totally gassed. 4) I think the end of the streak also helps by taking the spotlight away from them a little bit. Don’t get me wrong, they loved the attention they got, but that spotlight gets hot after a while, and I think they’re ready to go back to their West Coast isolation where three-fourths of the country is in bed before they tip off. You can’t play playoff-level basketball all year long, and that’s really what they’ve been doing ever since they broke the record three weeks ago. 4a) All of points 3 and 4 being said and agreed to, if they could wave a magic wand and have the streak be active, they’d do it. They really wanted to break that record. 5) Let’s not forget that they’re only four games up on San Antonio in the West, and they play three games against each other very late in the season. They can’t start to coast now, although the schedule-makers who were toying with them the last two weeks have flipped the script. After nine games in nine different cities over the last 16 days, now they play only five games in the next 16, all at home. If this coaching staff wants to go back to the All-Star game, and you would think they do, this team has to hold off the Spurs. 6) Will they start a new streak? Well, you’ll certainly see lots of runs of five-to-ten-game streaks, but I don’t know if they’ll again threaten the 1972 Lakers. Walton will have to rest players, especially after the All-Star break, and they need to be prepared to lose some of those games. 7) This is a weird place to put an earth-shattering prediction, but here it is. The Warriors will not only beat the 1996 Chicago Bulls’ 72-game record, they’ll do it easily. I can’t see them losing more than five or six games the rest of the way. Who knows? Without the Random Bounce and the Obvious Missed Call, they might not have lost any.